Remember as a kid your parents if they drank Red Rose tea, they would give you those cute little tea cards? Well while I was blogging around on dial up the other night ,which was painfully slow, I found a challenge blog through another blogger's site and it is called Just For Fun. I was taking a peek at this new little blog and the thing that most attracted me to it was you don't need a lot of fancy name brand items, just use stuff in your stash and create with what you have on hand, no prizes, no sponsors, just make some friends and share your creations with them. So this weeks challenge was to make tea cards. As you know I was playing with those magnets and I have really been taken with my oil pastels so I decided to make a few tea cards. Well one turned into 2 then turned into a few more and a few more and so on. Yikes I am still making them. The idea of tea cards from the original designs are they measure 1 1/2 x 2 1/2 with a white border around them and if you remember they often ran in series. As well they were brightly coloured. So I dug out my stamps, black ink, white card stock, oil pastels and did some playing. I first made a border to fit around my tea card. How did I do that? I cut many tea cards out and took one and measured 1/8th of an inch in from each side, I marked with the pencil at the top and bottom all around. I connected the markings so you have a thin border around and a rectangle in the center. I used a straight edge and lined up the lines and carefully with a craft knife trimmed the inside out. Next I placed repositional glue from my little pen all along the border and let it dry it. This remains tacky but not gluey if you let it sit and tack up, if you put it directly onto the paper when the glue is still blue and wet it will stay there permanently and I did not want that. I wanted to be able to remove it once I was done colouring inside the tea card. Once the border was tacked up I then placed it around the outside edges of my tea card. I stamped images in black for a bold look. Some images I embossed with black EP some I just left the black ink. Then if I wanted more stamping like the bird with the script I stamped another bird then cut it out as a mask, placed it over the existing image, stamped the script then removed the mask. I then started colouring with my pastels. The butterflies I used a marker to colour them in to reveal bright bold colours. The pastels are scribbled on then smudged and blended then I took a tissue and rubbed most of it off. I did find if you want a thin border around your image then do that first before applying the pastels as the oil in the pastels resists ink. You don't have to even put a thin border but in some cases it adds a nice touch. After you are done colouring your backgrounds then remove that thin border carefully and you now have a white border around your tea card. These would look really nice on small cards as your main image, you could put them on ATC's. you could use them to put your artist info on the back and send along with your trades or you could simply do a series of them and trade them. How fun would that be???? I hope you enjoy these tea cards. A great way to use up scraps of your white card stock. You could even use Twinkling H20's, watercolours, paint, etc. Use whatever you like and whatever you have on hand. Remember tho that you must do the required size and the white border. You are on quite the roll! Beautiful- I do not remember tea cards...I guess I missed out! Love the variety in the colors. 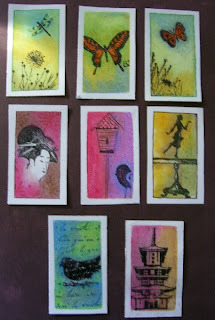 Love your tea cards what a fun idea. These are really pretty. I don't remember tea cards either. I have 2 full sets of cards like the ones you mentioned, except they come from my granddad's cigars! One is of dogs and the other is of birds! What a magnificent set o f tea cards truly beautiful. Such beautiful images and stamping a real inspiration. 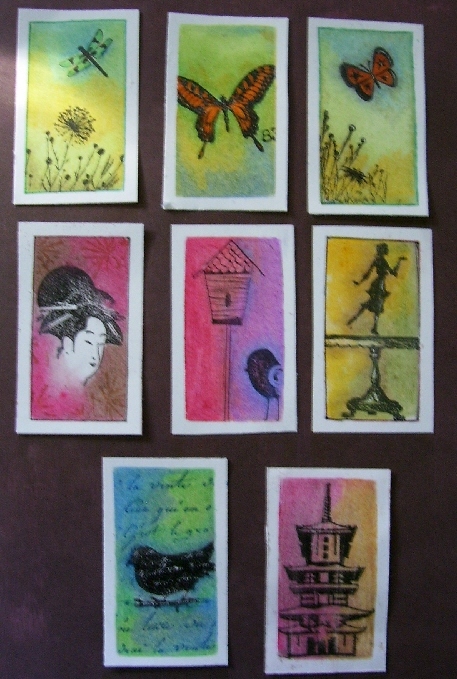 Lovely set of tea cards,gorgeous colours. I am so glad you found us via another blog and extra pleased you liked the theme for this week. You certainly did us proud with your tea cards. Wonderful colours (must try the pastels myself - I have a tin full of little bits)and great images you have chosen. WOW I think you've become a tea card addict - lol. They are all fabulous and I love the bright colours, the white frame really makes them pop. Glad you managed to find us as it really does look like you had fun with them, and that's what we are all about - JFF. I so loved those tea cards.. you did a fab job with these.. love them.. haven't played with pastels much as yet... they do look pretty..